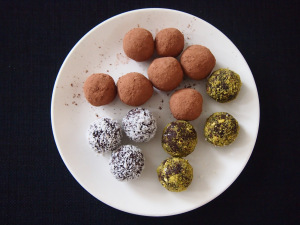 Yay, we have another happy blogger posting Bliss Balls! Well they are round, so that’s pretty close isn’t it!!! Thanks Hungry Club for your Mint Chocolate Truffles. I’ve always had a thing for truffles. I don’t know what it is. 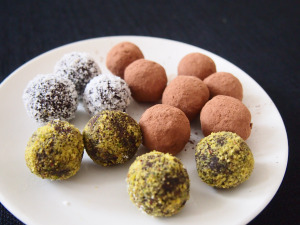 Ever since I was a kid I’ve loved making, and subsequently devouring, truffles of all types and flavours. They always felt like such a fancy treat, so now, with a abundance of tried and true flavour combinations; they’re my go to snack for afternoon visitors or to pack into The Man’s lunch. Peppermint and chocolate is one of my favourite combinations, it’s refreshing and delectable! Be careful when adding the flavour oil, if you accidentally add a smidge too much it can be like licking toothpaste off a candy-cane – peppermint overload. I like to drop mine onto a spoon first and then tip into the mixture. Too many slip ups have taught me caution!